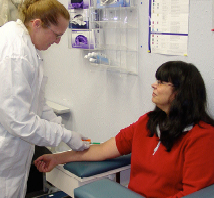 The Phlebotomy certificate program teaches skills and techniques to students who are interested in a variety of health care professions. Students learn techniques for the collection of blood from patients or donors for diagnostic testing. In addition, ethical and legal responsibilities, effective communication skills and safe practices are studied. Phlebotomists are employed in hospitals, hospital laboratories, physicians’ offices, clinics, blood banks, commercial laboratories, ambulatory health care services, home health care agencies, etc. 1. Student must be 18 years of age or older. 2. Student must have either a high school diploma or a GED. 3. Student must have a minimum GPA of 2.0. 4. Student may be required to complete a placement test and achieve minimum entry-level scores at or above the 34th percentile. 5. Student must possess basic computer skills (course completion, documentation of work skills or enrollment in computer course during the first semester of Phlebotomy). 6. Medical Terminology is required prior to/or in conjunction with PHB 1220, Phlebotomy Theory.